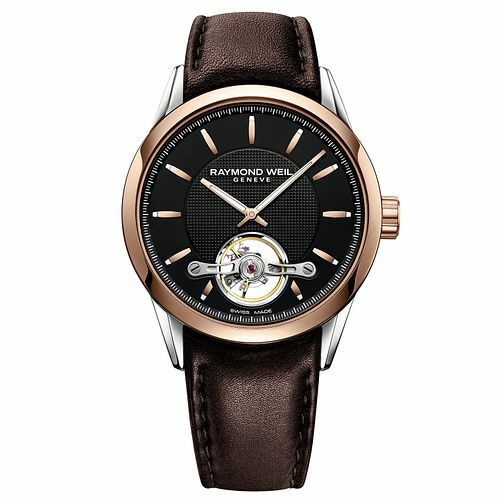 Raymond Weil has crafted a refined and sophisticated look that uses rose gold plating and minimalistic dial details that are punctuated by a balance-and-spring mechanism that reveals the inner working of the watch that gives it an industrial twist. For those who enjoy the craftsmanship of Swiss-made watches, look no further for the inner and outward precision of the Freelancer. Raymond Weil Freelancer Men's Brown Leather Strap Watch is rated 5.0 out of 5 by 1. Rated 5 out of 5 by Anonymous from Good value for money Superb craftsmanship. Appealing to the eye. Sapphire glass face and back. I love this Swiss watch and will look to make other future purchases from this brand.